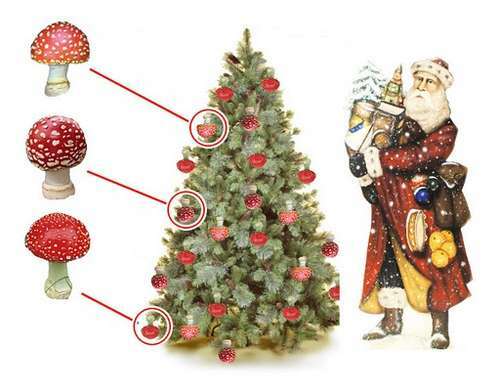 Why do many people recall their families having mushroom santa ornaments hanging on the Christmas tree? As many have noted, December 21st, was the Winter Solstice. Its the shortest day (or the longest night) where, in some northerly places, the sun isn’t seen again for THREE DAYS before beginning its ascent, back into the sky in time for the Spring Equinox. If the story of the sun, divided into 12 chapters of the Zodiac, falling at the end of the year and being born again sounds oddly similar to the story of Jesus, Horace, Krishna, or Buddha then you are not alone in that observance…but we’re not talking about THAT in particular. In the far north, near the Arctic circle in places like Canada, Alaska, Siberia and Northern Europe the sun really does disappear for three days below the horizon. Interestingly enough, many of our Norse traditions, especially Christmas traditions, originate in such places. So lets dive a bit deeper into the finer points of these Christmas traditions. Santa, on his sleigh pulled by reindeer, with his big bag comes down the chimney to place gifts beneath the colorfully adorned Christmas tree and in the stockings hung by the fire with care, right? Lets start with the reindeer. In the north country people didn’t ride on horse-drawn carriages because there are no horses and there is too much snow, so people rode sleds pulled by caribou and reindeer, which are the animals indigenous to those regions of the world. 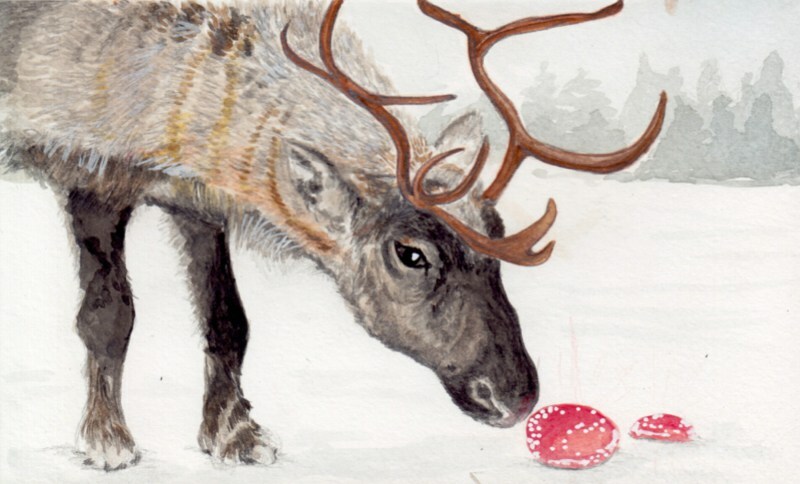 The reindeer exist during the winter months on brush, grass, trees, and mushrooms that grow in the light snow cover beneath the conifer trees. Christmas trees. A evergreen, conifer, tree that grow in the north country. During the fall and early winter, and again in the spring, brightly colored red and white mushrooms (amanita muscaria) grow beneath these pine trees. The Amanita Muscaria have been used for thousands of years as a medicine and as part of ceremony and ritual, particularly in the northern latitudes of the world. It is reported to have a mild psychoactive effect, similar to that of the famed “magic mushrooms”. So in the upper latitudes of the world, where nightfall stretches its' shadows longest and the sun drops below the horizon for 3 days there are people who consume red and white psychoactive mushrooms that grow beneath pine trees. These mushrooms are consumed by people and animals alike. Often associated with religious ceremony and sacred plants is the Shaman. In the North the shaman would collect the sacred mushrooms that grow beneath the pine trees and, so as not to carry them all at once, would hang them from the pine trees, like brightly colored ornaments. 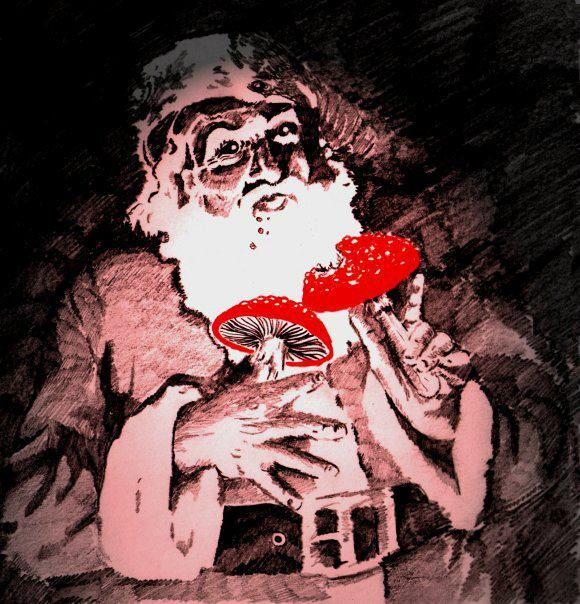 After picking many many of these red and white mushrooms the shaman’s bag would grow quite large, almost to the size of say, Santa’s sack of goodies…? When this large bag of goodies got full the Shaman would hop onto his reindeer-drawn sled and make his rounds to the local people’s houses of the community. In the north, where it snows quite a bit and quite often people would live in large teepees or yurts where they would burn fires inside their houses to stay warm. In these large teepee-like yurts the fires would burn as the snow fell higher and higher, leaving only the top of the yurt, where the smoke escapes, available for entry. The shaman would enter the yurts via the opening in the roof to deliver, from his satchel, the amanita mascaria. Mushrooms, and in this case the Amanita, must go through a process called decarboxylation, where the active compounds are made available by drying them out. Oftentimes people would fill their stockings with the amanita muscaria and hang them over the fireplaces in order to decarb the mushrooms. The mushrooms, once decarboxylated, could and would be consumed by the native people, together, in ceremony, as a community, to celebrate the rising of their Light Giver, the Sun, back into the sky, and to strengthen the ties of family, and prepare for the winter ahead. So why does Santa dress in all red with little white spots and come down the chimney to leave gifts before gliding away on a sled by flying reindeer? I don’t know either, but it’s a good question with some colorful answers!